© 2010 - 2012 Easy Gourmet Dinners, KLZ. I'll admit it: cooking is not my fortè. In fact, I've avoided the culinary arts most of my life because of the genetic tendency to gain weight that plagues my family of origin. I often have trouble enjoying a good meal, knowing that it can easily lead to tight clothes and regret. But once in a while, I manage to get excited about cooking, and one dish that I am learning to master is risotto. Tonight I made an asparagus risotto. This is not just any asparagus risotto, but one that also includes saffron, lemon zest, lavender shallots, and finely minced carrots. 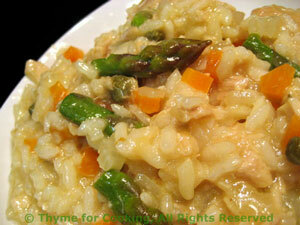 And of course, the usual risotto-making ingredients: Arborio rice, chicken broth, white wine and parmagiano cheese. Squisito! Since writing about food and cooking is also not my fortè, I'm not about to include the recipe, but I will say that it's one of many fabulous risotto recipes in Marie Simmons' book, The Amazing World of Rice. There's just something about the process of making risotto that is immensely enjoyable: for me, it's akin to creating a fine work of art. And once you master the basic risotto recipe, there are millions of variations.With tonight's effort, first I heated the saffron and mixed it with white wine, leaving it to stand while I prepared other ingredients. I usually heat the broth early in the process, bringing it to a simmer, as having warm broth at the ready is essential to the rice-cooking process. Cutting up vegetables adds to the fun: slicing carrots and shallots, then dicing them into tiny fragments that add both flavor and color to the rice mixture. Asparagus is cut on the diagonal, then set aside, while the risotto and broth are joined, bit by bit, to the tenderized carrots and shallots. Ladle by ladle, broth is added, allowing time for the rice to absorb the liquid slowly, transforming the hard white kernels into a creamy texture as the rice bulks up and softens. I poured a glass of pinot grigio to drink while cooking, then turned on the stereo: Vivaldi's Four Seasons seemed to be the perfect accompaniment to the evening. I stood by the stove and stirred the rice, adding broth every five minutes or so, enjoying watching as the orangey flecks of carrot swirled amidst the white spheres of rice. I stirred with a wooden spoon, creating a pattern in the mixture as it twisted and turned in the pan. I'm not quite sure why I enjoy the process of making risotto as much as I do, but tonight it was even better than usual. Perhaps it's because I'm getting better at it, and each time I try a new recipe, the result is more satisfying. Or perhaps it's because I'll soon be in Italy again, and I enjoy getting into my "Italian mind." When the risotto was nearly done, I added the asparagus, lemon zest and lemon juice. Combining the fresh greens and citrus with the rice added another element of delight, and Vivaldi trilled in the background as the risotto was nearing its peak. The final touch: a dab of butter, a handful of parmigiano, stirred in quickly and vigorously, giving an extra measure of creaminess to the mixture. And voila! It's done! And it's perfect! Squisito! The asparagus is still crunchy, the risotto has just a bit of resistance, and the rest is a creamy, delicious and satisfying treat. I spoon a small portion into a dish and savor the colors and flavors: crunchy green, creamy white, savory yellow, orange, lavender. Every bite is rich, satisfying, delightful. My son arrives home from work just in time, as risotto tastes best when it's fresh, and he digs into the fragrant pan. Yes, it's better than the last time I tried it. Can it get any better? Perhaps the next time I make it, I'll be in Italy, and sharing it with friends. Surely that will add another dimension of flavor. Chissà? Spero di si!